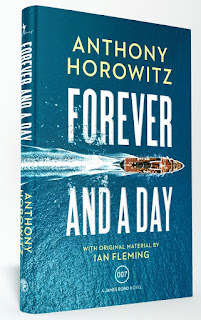 Anthony Horowitz's second Bond novel, Forever and a Day, is released today in the UK by Jonathan Cape. (The U.S. edition will wait until November 6.) This time we see Bond's first mission as a double-oh agent in what amounts to a prequel to Casino Royale. I've had the great pleasure of reading the book, and I'm happy to report that it's a another strong Bond novel from Horowitz. 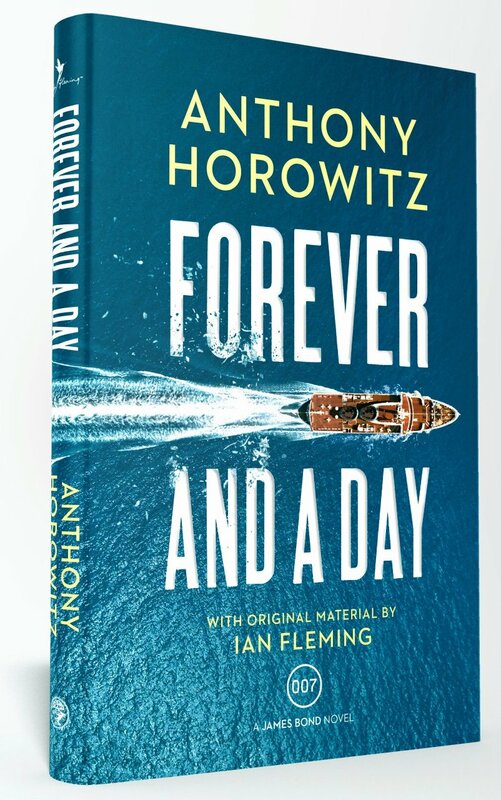 But I have to be honest in saying that while I thoroughly enjoyed Forever and a Day, I preferred Horowitz's Trigger Mortis. Every beat of that first book felt original to me, while every beat of this book felt familiar. It has familiar locations (South of France), familiar situations (a casino, a party, warehouses), familiar allies (CIA agent), and a familiar villain's plot (I'll keep this review spoiler free, but this one comes right out of a movie). Also, the original Fleming material, a story about a mad Russian who threatens to shell the casino at Monte Carlo, is related as a past event. It's a great story (or scene), and I'm surprised it wasn't integrated into the plot, as Horowitz did with the race car action in Trigger Mortis. And the idea that Bond "saved the casino" a year earlier undermines the whole idea of this being 007s first mission. Bond walks into the casino and he's greeted like Roger Moore! The action also takes an unusually long time to kick in, but this is because Horowitz takes time to develop a strong Bond Girl in Sixteen. And once the action finally does kick in (around page 200), it is a relentless rush with a spectacular extended climax aboard the villain's luxury cruise ship. Again, no spoilers, but what Bond has to endure physically -- always a highlight of any Bond book -- is something we've never seen in any Bond adventure, and it's harrowing! This chapter alone makes Forever and a Day unforgettable and a classic among continuation novels. So apart from my quibbles, I'm thrilled to have another beautifully written James Bond novel from the pen of Anthony Horowitz. I hope we get some more. Purchase Forever and a Day from Amazon.co.uk. The early chapters are great. Horowitz really walks in Fleming’s shoes . However the plot has some juvenile aspects. More reminiscent of the movies than the books and the dialogue is a bit clunky. Overall, well worth reading but not as good as ‘Colonel Sun’ which remains the gold standard in the continuation game. Hi John thanks for the review. But isn't this his first mission as a OO, not his first mission ever, that would explain why he is known to the Casino as explained in the Fleming material chapter. I understand. But I feel like this special world in which he saves casinos and is recognized by every waiter and croupier came about because of his magic 007 designation. This mission is his first rime in that world. But I get it. Doesn't have to be. But it feels a bit off.